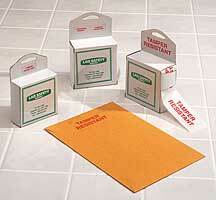 Easy to write upon pill boxes for identification and filing. The "shell" or outer sleeve is covered with glossy white paper. Both tray and shell are rigid and strong. Available in four sizes. 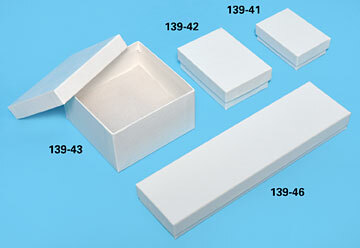 Boxes with top lid, made with white lined "board", outside and edges finished with white glossy paper with a swirl pattern. Each box comes with a soft polyester fill pad. Available in 4 sizes, sold in packages of 100. Store flat and fold into a box when needed. Made from die cut and scored 0.025" thick white cardboard. 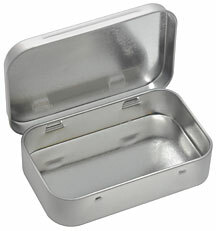 A small tin box with hinged lid, useful for storing samples, holders or parts. Tin plated steel avoids static charge. 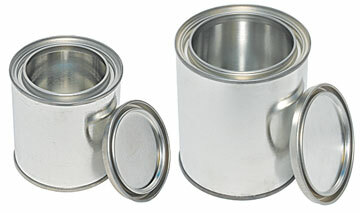 Tin Cans for storing liquid or powders, samples, etc. Available in 1/2 pint (235ml) and 1 pint (473ml) size.